A 1995 video by Corey Shaff documents the Gas Station in its last days. Of the many galleries and art spaces that opened in the 1980s East Village, none was as visually conspicuous as the converted, open-air “Gas Station” at the corner of Avenue B and East Second Street. After curator Ruben Garcia secured the lease to the lot, a group of metal sculptors had put up a wall of junk metal around its perimeter. The intimidating barrier enclosed an exhibition and performance space, as well as welding facilities and art studios. Gallery 98’s current online exhibition Linus Coraggio, Toyo Tsuchiya, and the Rivington School, 1983–95 situates the Gas Station as a continuation of the rough-edged “Rivington School” aesthetic that had developed at the social club No Se No and at the junkyard sculpture garden at the Lower East Side corner of Rivington and Forsyth. For much of its time, the Gas Station was managed by artist Linus Coraggio, a key player in the Rivington sculpture garden. Established when the Lower East Side was still riddled with abandoned buildings and rubble-filled lots, the Gas Station would meet its demise as the East Village gentrified. Garcia and Coraggio could only battle re-development for so long. Coraggio abandoned his studio in October 1995, when it was (in his words) “due to be padlocked by [the] sheriff.” The new documentary Shadowman alludes to the rat-infested metal shed at the Gas Station where artist Richard Hambleton, at one of his low points, illegally continued to live and work for five more months before the demolition trucks came in March 1996. 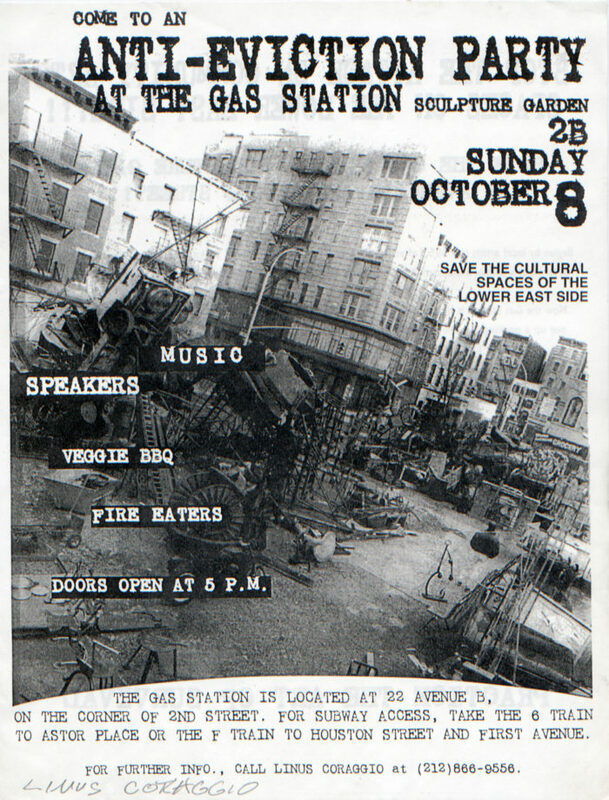 Flyer for the Gas Station’s anti-eviction party, 1995. Part of Gallery 98’s Rivington School exhibition.